Scalp Psoriasis symptoms are similar to symptoms indicative of skin psoriasis flare-ups, and nearly half of all psoriasis sufferers at some point will experience one of these events. 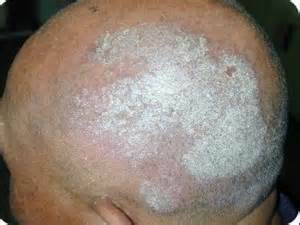 Scalp psoriasis can appear as one spot, as several patches or cover the entire scalp. Sometimes scalp psoriasis begins on the scalp, but may eventually spread to the neck, upper back and shoulders if left untreated. Hair loss that occurs because of constant scratching is reversible when lesions are eliminated with treatment and the scalp is no longer irritated. The U.S. Food and Drug Administration has approved two over the counter medications for the treatment of scalp psoriasis: coal tar and salicylic acid. Coal tar, a by-product of coal distillation, has been used for many years to soothe the annoying itchiness of many inflammatory skin conditions. Coal tar helps relieve scalp psoriasis symptoms by obstructing DNA activity that contributes to abnormally rapid cell growth and death, the primary source of psoriasis lesions. A variety of shampoos and creams contain coal tar or a coal tar solution. Typically, the user applies the product to his or her scalp and leaves it on for fifteen to 30 minutes before rinsing. Technically defined as a peeling agent, salicylic acid reduces the severity of psoriasis itching, soreness and flaking by encouraging the shedding of layers of dead skin cells that comprise lesions. This substance facilitates removal of scalp plaques by softening the lesions and making them easier to peel away from hair shafts. When excessive scratching causes skin breaks that allow bacterial or fungal infections to set in, salicylic acid is also useful as an antiseptic to kill germs that may further inflame psoriatic lesions. Various topical corticosteroid solutions . For severe outbreaks of , scalp psoriasis medications, injected over a short time, may be necessary. Injections of immunomodulators, retinoids or hydroxyurea work by direct immune system suppression which acts quickly to slow down the accelerated production of skin cells. Patients being treated for mild, moderate and severe scalp psoriasis may begin experiencing symptomatic relief around three or four weeks following initiation of a treatment regimen and up to eight weeks before a psoriasis outbreak has significantly diminished. A severe form of dandruff called seborrheic dermatitis is often mistaken for scalp psoriasis because it also produces itching and flaking. However, seborrheic dermatitis is recognizable by the appearance of slick-looking, red patches on the scalp made of white or yellow sebum flakes that are easily removed. Produced by the sebaceous glands, sebum is an oily substance meant to lubricate the skin. People affected by seborrhea have overproductive scalp sebaceous glands that create the flaking and itching. Alternately, psoriasis lesions are made of dead skin cells that are more difficult to remove. In addition to obtaining seeing your doctor and receiving appropriate medications, you can further help alleviate scalp psoriasis symptoms by trying not to scratch your scalp, gently shampooing your scalp instead of vigorously rubbing it and removing scales carefully to avoid breaking the skin enough to cause bleeding.